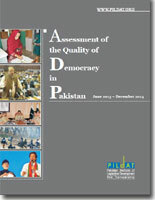 The Assessment of the Quality of Democracy in Pakistan, June 2013 – December 2014 is a report prepared by PILDAT to evaluate the quality of democracy in Pakistan during this period. The report period has been calculated from June 05, 2014, the date the newly-elected Prime Minister of Pakistan, Mr. Muhammad Nawaz Sharif, MNA, took oath of office, to December 31, 2014, the end of the calendar year. Although the beginning of the period under consideration saw the first ever civilian transfer of power, along with other developments that greatly supported the quality of democracy in Pakistan, the subsequent 18 months of the PML-N Government saw, in PILDAT’s opinion a gradual deterioration of the quality of the democracy. The period is therefore characterized by tumultuous developments such as the protests carried out by the Pakistan Tehreek-e-Insaf (PTI) and the Pakistan Awami Tehreek (PAT) against alleged massive rigging in General Election 2013, increased incidents of terrorism, the rise of the Military in domains which are usually considered to be under the ambit of the civilian Government, etc. The report is based on data analysis and scores compiled by the PILDAT Team under the leadership of Mr. Ahmed Bilal Mehboob, President, Ms. Aasiya Riaz, Joint Director, and researched and coordinated by Mr. Muhammad Saad, Assistant Projects Officer. Dr. Niaz Murtaza, Senior Fellow at the UC Berkley and a specialist in Political Economy and Development, has been commissioned by PILDAT as the lead author who has written the report under guidance from PILDAT’s Democracy Assessment Group (DAG).